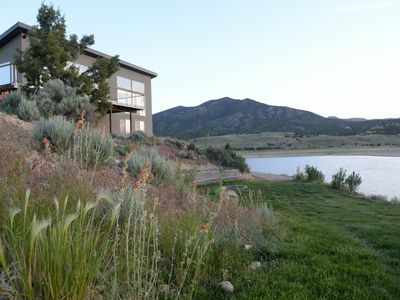 A tranquil Utah mountain escape awaits at this 1400 sq. 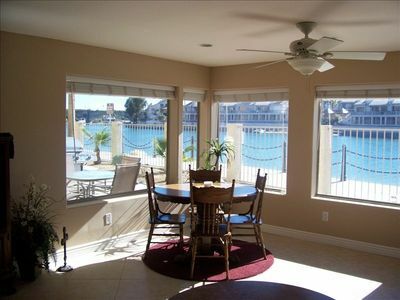 ft, 1-bed, 1-bath Sterling vacation rental cabin. Rustic wooden accents are featured throughout the open floor plan of the living space where windows open to mountain views. 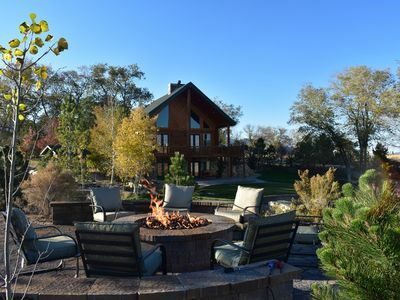 The home has comfortable seating indoors, on the porch, deck and beside the fire pit so you can unwind after the day. 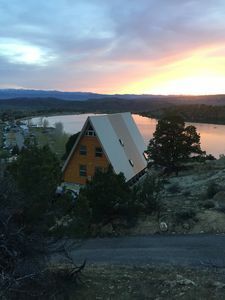 Palisade State Park and Golf Course is across the street, promising carefree days beside the water or on the fairways during your idyllic cabin retreat. 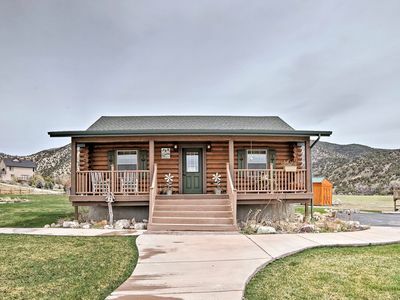 Cozy, charming, and quaint, this cabin offers a great family getaway to Sanpete Mountain. 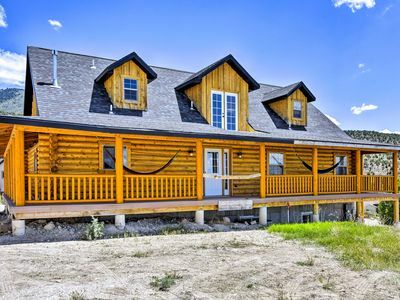 Hardwood floors, tasteful decor, and a serene natural setting close to nearby parks make this cabin the perfect starting point for boundless outdoor pursuits. Snuggle into the sectional sofa while you read a few chapters of your favorite book. Catch up on your shows on the flat-screen Satellite TV or browse the DVD collection and watch an old favorite film. You'll find everything you need to prepare delicious meals in the well-equipped kitchenette. The elongated peninsula opens to the living area, letting you mingle with your group while you cook. For a change of pace, fire up the charcoal grill and dine al fresco on the deck while the kids explore the backyard jungle gym. Gather around the fire pit and watch as the stars come out over the panoramic vistas surrounding your vacation paradise. As your eyes grow heavy, head downstairs to the roomy bedroom and settle down for the night. In the morning, step out to the spacious front porch and relax in one of the rockers as you begin another perfect day in Sterling. Make the most of your time next to Palisade State Park and play a round on the 18-hole course with the available clubs. The paddleboat promises a pleasant afternoon on the wake-free waters of the reservoir. Pack a picnic to take with you while you stroll the trails to find the perfect lunch spot. Explore the deep sandstone canyons, meadows, and streams of the Manti-La Sal National Forest where miles of hiking, mountain biking, and panoramic vistas await. Rent an ATV and go off-roading for spectacular views atop Skyline Drive. Drive 6 miles up the highway to meander through charming downtown Manti. If you visit in June, be sure to experience the Manti Miracle Pageant of 800 people performing under the stars. 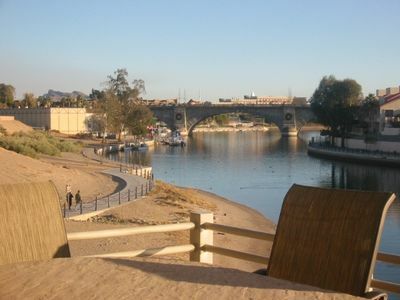 The delightful Spring City is on the National Register of Historic Places and offers an immersive historical visit 24 miles from your vacation home. Lodges at Pheasant Run is tucked away in the beautiful country, sleeps over 60! 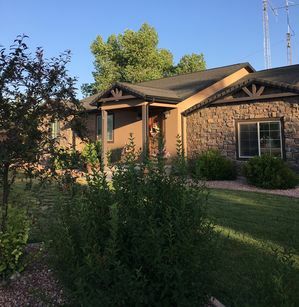 BEAUTIFUL downstairs Suite in Central Utah!! Cabin w/ Theater Room by Palisade State Park!